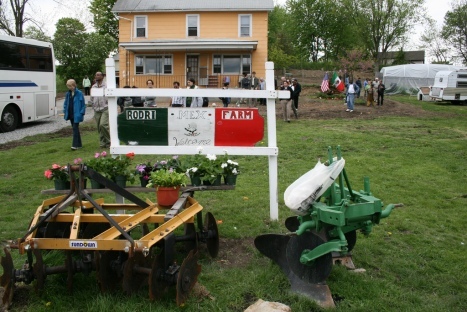 Our partnering farm is MimoMex Farm, is located on 16 acres in the Black Dirt Region in the town of Goshen, New York. Goshen is situated about 46 miles from North Brooklyn, in a valley area known for its extremely fertile soil left over from an ancient glacial lake bottom. Nestled within the bosom of the Northeast Appalachian ranges, this series of valleys is a combination of areas with rocky forest land and rich cultivatable soil that is chiefly devoted to the industry of agriculture. It is owned and operated by Martín & Gaudencia Rodriguez. Martín & Gaudencia both grew up on farms in Mexico and have 20+ years of farming experience. They have been on their farm in Goshen for about 5 years, and own most of the land they cultivate. This will be their third year as CSA farmers; they partner with 2 other Brooklyn CSAs (Southside and Sunset Park). MimoMex, named after Martín’s son, is a success story for the New Farmer Development Project, a program that encourages immigrants to farm in the region. The program runs a training course to teach immigrants who already have agricultural experience how to navigate the US farming industry. MimoMex is the first graduating farm of NFDP to own its own land. Next Next post: Not Sure What To Make With Your CSA Share?